Last year I was building a WordPress site for a freelance project. When I was ready to share my progress with the client, I got my staging site up so they could see the progress I had made so far. 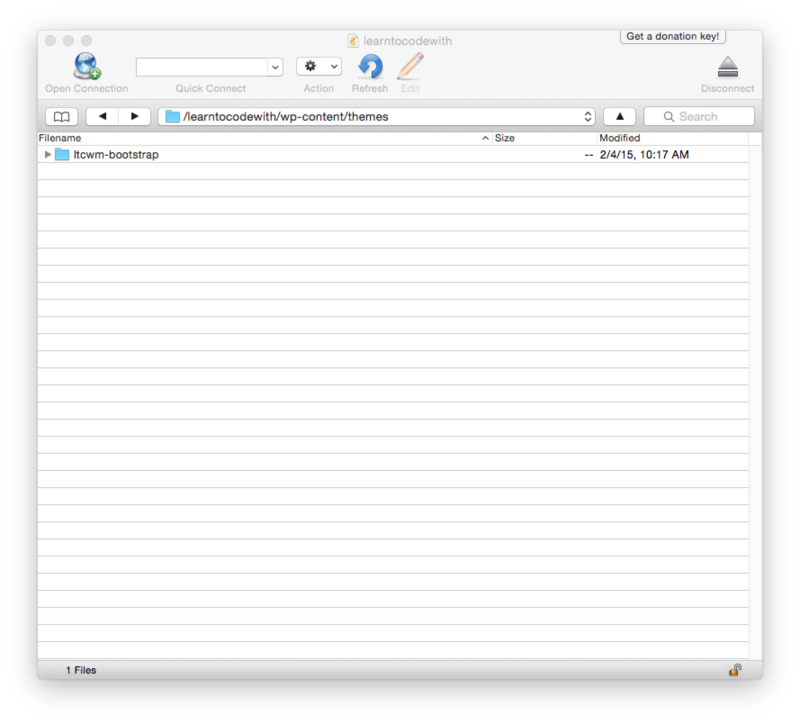 As I was distracted, moving things around in my FTP, I accidentally deleted several important theme files. It took me a few minutes to even realize what I had done. But once I did, my heart jumped out of my chest. Did I seriously just accidentally delete a quarter of the theme files? Cue the Macaulay Culkin scream. It took me a few moments to remember that I could somewhat easily restore a version of the site from earlier that day. Sure, not all the changes I had made just before were brought over, but at least it was something. Having a plan in place to back up your site is absolutely critical for anyone and everyone who has a website – from the least-techie beginners to full-stack lead developers. Trust me, you’ll save yourself from so much heartache if you read and follow along! Backing up, plain and simple, is saving a duplicate version of all your work. 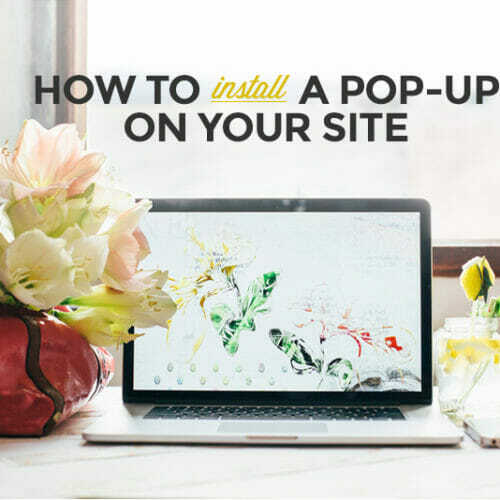 This includes your website theme and related site files (like plugins) as well as your database (which includes posts, users, comments, etc.). Your website is no exception. Before talking more about backing up, realize that prevention measures can and should be put in place to keep your site safe and secure. But even when you’re safe and implement all the right security measures: things can always go wrong. That’s why having a backup system for your WordPress site(s) is important. This article discusses the different ways you can do just that—but without a plugin. Wait…Why Not Use a WordPress Plugin!? For those unfamiliar with all the aspects of WordPress,plugins allow you to add onto the functionality that already exists with WordPress sites. While you can create your own plugin, there are many plugins that already exist that you can download and use on your site. (At the time of writing, over 37,000 are available to download!) There are lots of backup plugins out there. Some are good, some are better. Some are free, and some cost money. There is nothing wrong with using a trusted backup plugin like BackupBuddy. 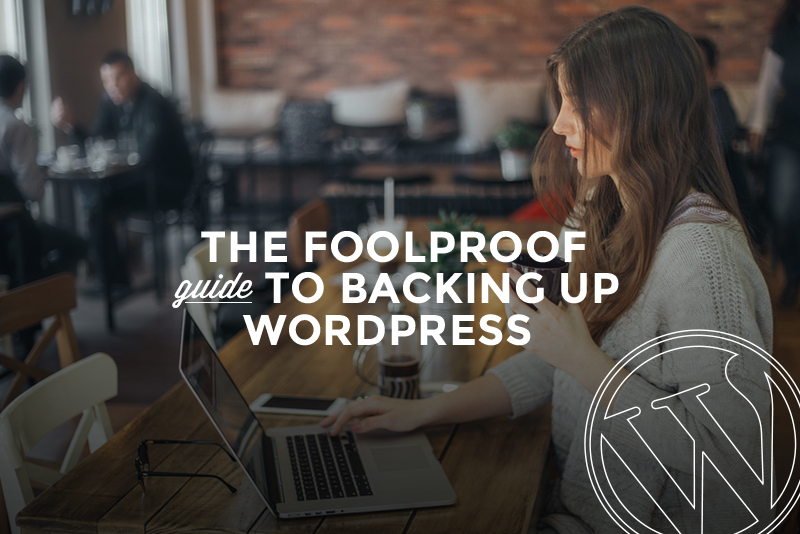 However, backing up is best done at the server level—not the site level. Think about it: a plugin, doing automatic backups of your (perhaps) very large site, is like extra weight on your server. Every time it does a backup (which could be daily), it’s doing “work”—which could slow down your site among other things. Also, in my professional opinion, the fewer plugins on your WordPress site, the better. While some may disagree, from my perspective, the more control you have over your site and its innerworkings, the better. It’s smart to rely on yourself rather than a 3rd party—especially when it comes to backing up your treasured site files. Now, I am not saying you should forgo plugins all together. I love some of mine and use them all the time. But do be aware of some of the downsides to amassing large quantities of plugins. And almost all would agree that it’s best practice to keep 3rd party plugins up to date and delete any you are not using. Before diving into the different ways you can back up your site without a plugin, let’s talk about what you can and should back up: site files and databases. 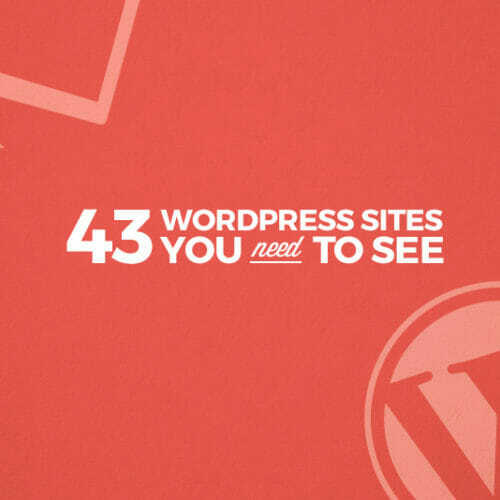 When building WordPress sites, you really don’t tinker with much beyond WordPress Plugins and Themes. (Both found in the wp-content directory.) However, it is still wise to backup ALL parts of your site so you don’t end up trying to restore only part of your site, or worse—trying to figure out which part of your site is missing so you can piece it back together! Backing up the entire site makes it way easier to restore if something does go wrong. For a more in-depth look at WordPress files, look to the WordPress Codex. Realize that when you do backups at the server level, most hosts will back up your site files, too. However, it can take awhile to restore all these files from your server if your site were to go down. And obviously you want to get things up and running again as fast as possible. Plus, it’s always good to have an additional copy. As I talk about later: it’s never smart to have all your eggs in one basket. 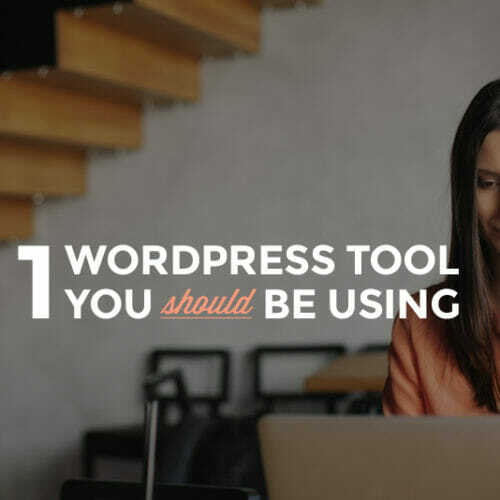 However, there are also other software tools available, like WinSCP, that make mirror copies of site files and save them on your desktop—which can save you time. And then for more advanced users using the WP-CLI command line interface, backing up site files can be done from the command line and saved to your computer. And of course, you can usually make backup copies of site files right from your server. As you can see, there are multiple ways you can back up your website files. What matters most is that you are backing up your WordPress site files. Backing up your site files alone is not enough, though. Your site files do not contain all your website information (like blog posts and pages). 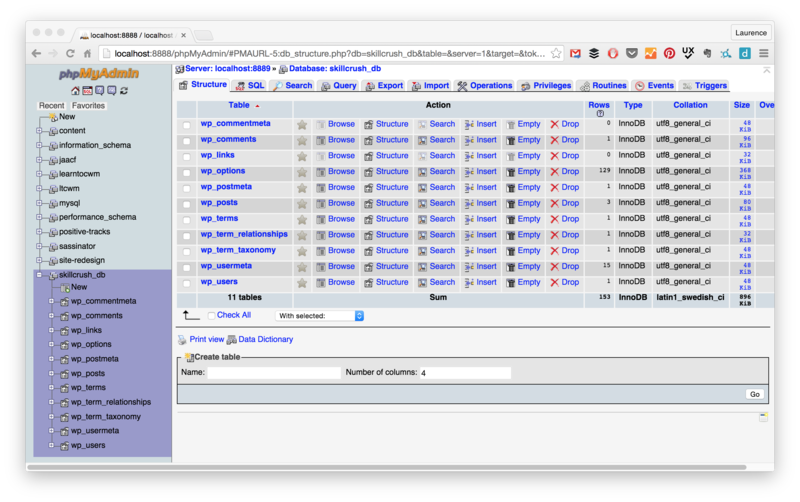 To have a complete replica of your site, you also need to back up your MySQL database. 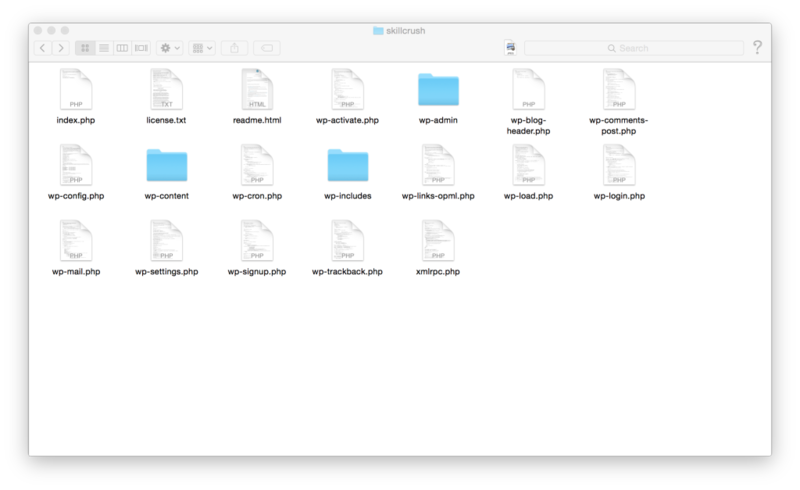 Looking back to my post, How to Install WordPress on Your Mac Using MAMP, where I set up a fresh WordPress site locally with a database named “skillcrush_db”, you can see the database tables that WordPress comes with. These tables hold certain site contents. 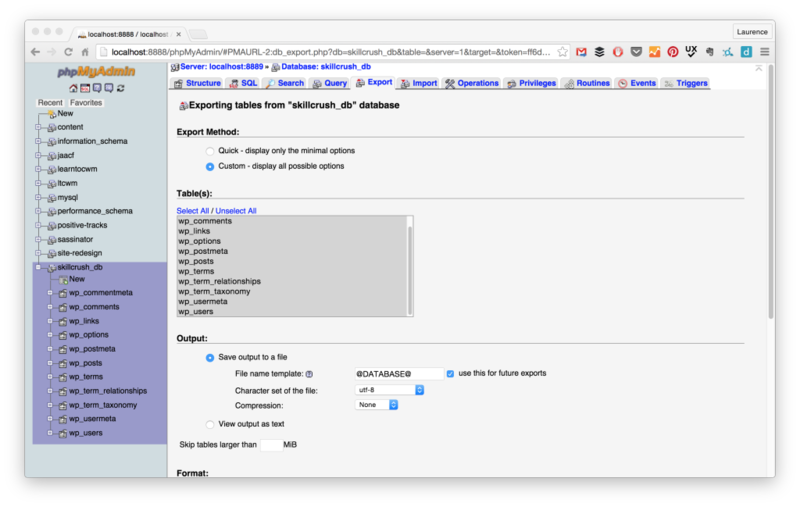 For example, this is what the skillcrush_db posts table looks like. Of course, a larger site with lots of posts and pages will have many more entries. The point is: you want to back up your MySQL database along with your website files. Both of these together, site files and your database, make up your entire site. One without the other is not your full site. 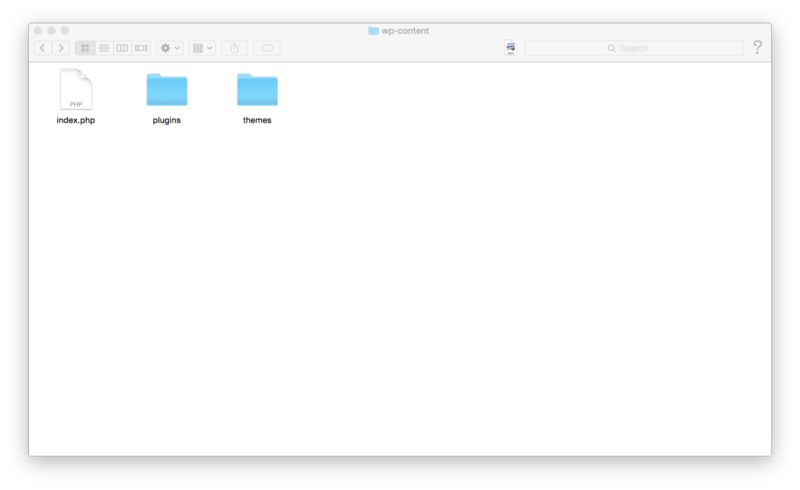 If you back up your files alone, it will just be an empty theme: no posts, no pages, no added media library images. 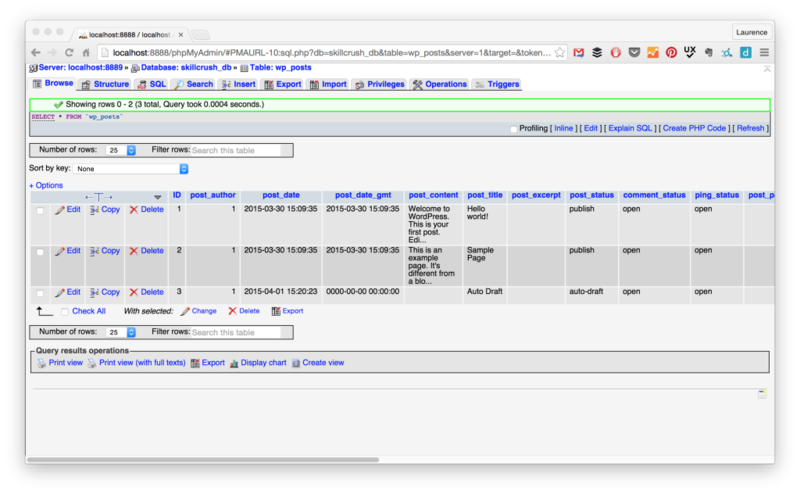 If you back up your database alone, you will have content (the posts, the pages, etc. ), but you will not have a theme, or appearance and functionality. Now, let’s talk about how you can back up website files and databases without relying on a plugin. The following section is broken down into three types of backups: automatic, manual and other. Automatic backups of your WordPress site are just as they sound: automatic. They happen on their own, without you having to do anything. Aside from plugins and other more advanced CLI tools that do this, automatic backups can also be done at the server level. Most legitimate WordPress-friendly hosts offer automatic backups as part of their service, or for a small additional fee. For instance, my WordPress host, Bluehost, has automatic backups that come with the hosting service at no extra cost. They also have a “Backup Pro” add-on service (for an additional fee) that gives more features and makes backing up and restoring more convenient. Again, this is standard for most WordPress friendly hosts. And if you decide to use a more premium hosting service, like WP Engine, backup and restore features will be more feature-rich. Note: your host should keep your automatic backups on a separate server than the one your website lives on. Because if your site server is hacked, and your backups are stored on there, they will not survive. If you aren’t sure, make sure to contact customer service or tech support to find out. And like anything, generally the more you pay, the better quality and service you receive. The same goes with automatic backups at the server level. But of course, even high quality automatic backups at the server level are not foolproof. When I say “high quality”, I mean backups that are done regularly, stored on a separate server, and have other security measures in place. As secure as your automatic backup may be, don’t solely rely on it. Bad things can always happen…even if we put the appropriate prevention measures in place. While automatic backups on the server-level are awesome and convenient, you want other copies of your site saved in different places. Here are a few ways to do manual backups of your site files and databases. This way is probably the simplest. Depending on your host, your cPanel could look a bit different. 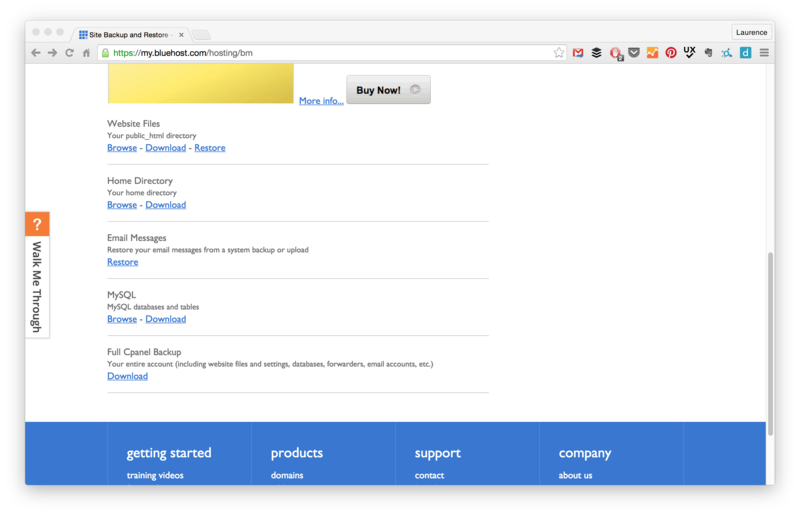 Home directory: Contains public_html directory along with other directories for your mail, FTP setups, etc. Full cPanel Backup: As the image below shows, this backs up your entire account. So if you have more than one site on your account (like I do), it will back up all files, settings, DBs, etc. for every one. You can also restore emails if you created email addresses on your server. You can then save these files to your computer, iCloud, external hard drive, thumb drive, etc. for safe keeping. Backing up my live site from the phpMyAdmin dashboard is not my preferred method because I do not like going into the live database for my site(s). However, you can read more about backing up via phpMyAdmin here. 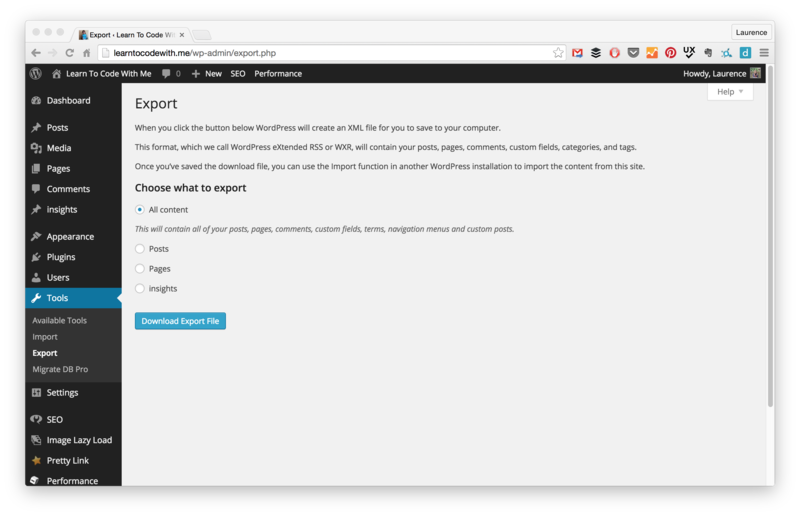 There are other ways you can save all your site data, like with the free WP export. It’s simple to do this from your admin panel. However, realize that WP exports do not export your theme, plugins, and other important website files. It is then easy to import this data on another WordPress site. You can also use your FTP to make a backup using Cyberduck or Filezilla. It’s as easy as downloading the files you want to save. Right click the files you want to save, then select “download.” Below you can see my theme on my live WordPress site in Cyberduck FTP. The WP CLI is also a more advanced WordPress tool. It is for people already comfortable using the command line. You can do different things all from the command that you would normally do in an admin panel: download plugins, manage user capabilities, manage sidebars, perform database operations, etc. Now, How Often Should You do a Manual Backup? That really depends on how frequently you update your site, both in terms of the site content and the design and functionality. On the other hand for my laurencebradford.com site, where I haven’t written a new blog post in over a year, I haven’t made a manual backup since August 2014. Why? Because the site has basically not changed since then. And if it were to go down, and I couldn’t restore it on the server level from an automatic backup, I would be OK with restoring it back to the August version. But my learntocodewith.me site? Going back to an August version would be catastrophic. I don’t even want to think about it: it makes me nauseous. The thought of losing all that work… I actually stopped writing this sentence just to do another manual back up of all my site files and my database. Anyway, that’s why I back up that site manually more often: it is updated much more regularly and is of higher importance to me. How Many Backups Should I Keep Around? This really depends on you and your site. This is especially true if you have updated the site significantly since, and do not ever plan on returning to the older versions. Sometimes if I am redoing a site, I will make more periodic theme-only backups (so, not the database). Just as a way to double-save my work. Similar to investing: you wouldn’t put all your savings into a single mutual fund. Because if it tanks, you’re in some serious trouble. The same line of reasoning can be applied to backing up your website files and databases. Don’t just back up on the server level. In fact, WordPress recommends keeping three different backup copies — all in different mediums (so CD, hard drive, desktop, cloud, etc). For my most important sites (which is really just one…) I maintain a recent database version locally (on my MAMP). In the end, always make sure to backup your work! It might take a little time or effort to set up, but think of the headache, anxiety, and working hours you’ll save by keeping a code apocalypse at bay. Laurence Bradford is a self-taught freelance web developer, focusing primarily on front-end technologies. She is also the creator of Learn to Code With Me, a site dedicated to helping beginners teach themselves how to code, and the Tech Careers Expert for About.com. 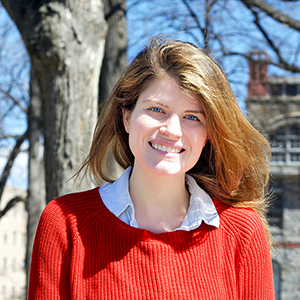 While she covers a range of tech topics, her primary focus is on web development and how to make a career transition into tech. 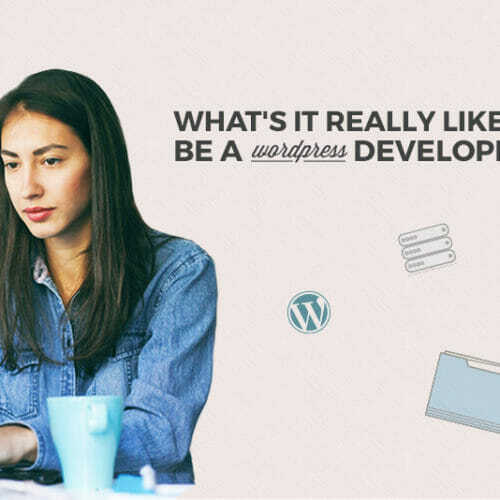 What’s It Really Like to Be a WordPress Developer?